Every year, in collaboration with market research firm IBISWorld, we gather together all of the latest company data to reveal a ranking by revenue of Australia’s heaviest hitters in food and beverage to create our Australia’s Top 100 Food & Drink Companies report. This report, which is sponsored by Foodmach, lists companies according to their most recently reported revenues in an easy-to-read format, and in this special edition, we’ll also reveal the shuffling of the ranks of Australia’s top ten companies, the best performing industry sectors, and the companies that rocketed up the list on rising revenues. Australia’s food and beverage sector is worth an annual $131 billion and is the nation’s largest manufacturing sector, and according to IBISWorld, the top 100 food and beverage companies in Australia collectively generate in excess of $104 billion in revenue (up from more than $100 billion in 2017-18) and employ more than 130,000 Australians. 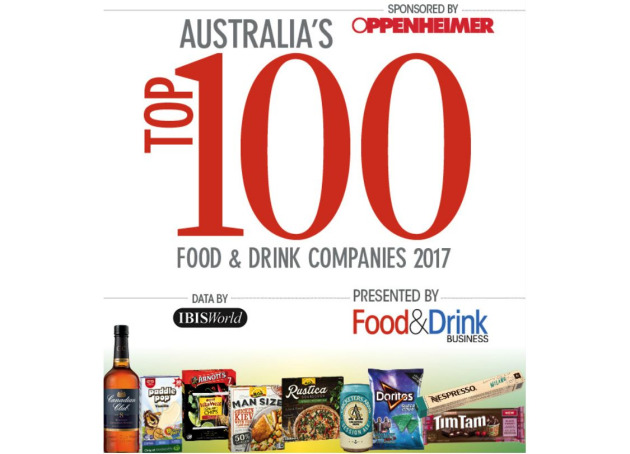 Several new companies also entered this year’s Top 100, either though market consolidation, organic growth, or due to their reclassification by IBISWorld, including PepsiCo Australia & New Zealand, Saputo Dairy Australia, Tassal Group, and Huon Aquaculture Group. List drop-offs included Mars and Burra Foods due to consolidation, while falling revenues saw last year’s #74 – Cerebos Foods, last year’s #94 – Tully Sugar, and last year’s #100 – Milne AgriGroup exit the list.